Technology site Techcrunch recently reported on three main trends reshaping the future of mobility: on electric, driverless and on demand. These three developments, each in their own stage of development, are collectively reshaping mobility in the 21th century and might be the solution to fast developing countries and cities, which need a new recipe in contrast to 20th century developed cities. As for electric vehicles, Tesla recently reported to reach an action radius of 700 km’s on 1 battery charge, which equals more or less one fuel tank of gasoline. And regarding autonomous vehicles, testing is done on public roads as we speak, though full implementation might take its time still. Let’s take a closer look at the third trend: ‘on demand’. ‘On demand’ refers to the ability of people to access mobility without needing to own a transportation vehicle. As this might not be directly to have a huge effect on car ownership in developed (western) cities –which mainly are designed to facilitate car ownership, as for example suburbia- this sharing-trend might just be the solution developing countries need, such as mega-cities in India, Africa or China. Through the use of apps and ICT, a new domain of ‘mobility brokers’ becomes part of the mobility arena. Their specific parts is to connect supply and demand, in one way or another. The first refers to on demand public transport initiatives, such as Bridj, a Boston startup facilitating bus rides for commuters, solely based on reservations. A well-known example of the second stream might be Uber, which is using private transportation as a basis for on demand transportation. 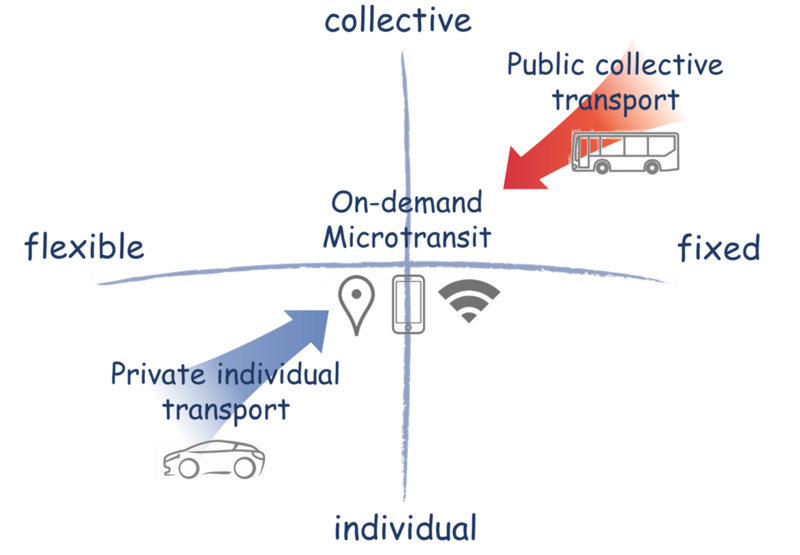 These two streams together are referred as ‘Microtransit’ and could be seen as a new form of modality, in between private individual and collective public transportation. Most important characteristic is the use of ICT in order to connect supply and demand. As this is still a minor form of transportation, the prospects are huge. Citylab reported on this, stating Micro Transit offers both opportunities and threats to current cities: as it offers more choices to people for transportation (improving their accessibility options), it also could lead to more transportation itself, further enhancing negative aspects such as congestion, pollution and their effect on urban quality. Still this niche form of transport can both offer possibilities for areas in which the current mainstream transportation (car and public transport) fail to offer an economic viable form of accessibility. As for public transport, this accounts for rural and even suburban areas, for the car this accounts for dense and congested urban areas. So what will- or can- happen if the three main trends collide: when autonomous driving electric vehicles will drive around and can be ordered on demand, like a pizza? Will it solve current urban challenges: pollution, congestion, social equity, urban quality? 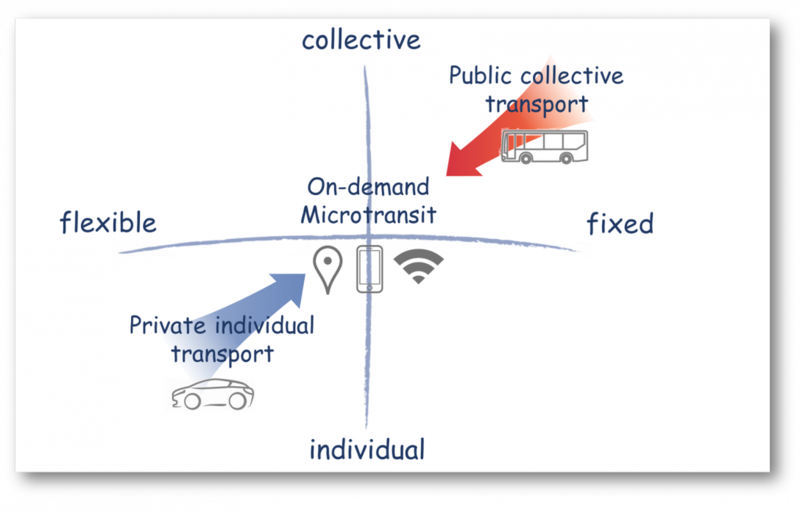 Or might it just enhance these aspects as a ‘digital divide’ occurs and Microtransit swipes away public transportation, becoming private transportation? And what about the bike, does it still fit in? Are we missing out a major opportunity if we transportation planners -again- avoid secondary aspects of transportation, parallel to the transition from horses to the automobile? Or do we need a new coherent approach on ‘smart mobility’, facilitating beneficial elements of the three main trends and integrating all modes of transport? Rekha on How Tel Aviv won the smart city award, without even knowing it is one?